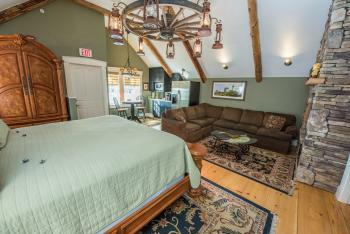 Barn Suite 1 is located in the South West corner of the barn on the second floor making this the brightest room. 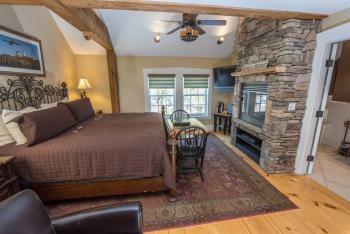 This room has a nice layout with a defined seating and bedroom area, it also has beautiful cathedral ceilings in the bedroom and bathroom. Each bathroom at the gazebo is equipped with a blow dryer, carefully chosen toiletries consisting of shampoo, conditioner, lotion, wildflower body soap, bayberry hand soap, disposable makeup remover, and a vanity kit. All rooms have wifi access, two bottled waters. An ironing station is set up for guests, as well as a washer and dryer in our guest laundry room, where you will also find a large ice-maker and ice buckets.. Robes as well as towels for the pool and beach are available in our gym. 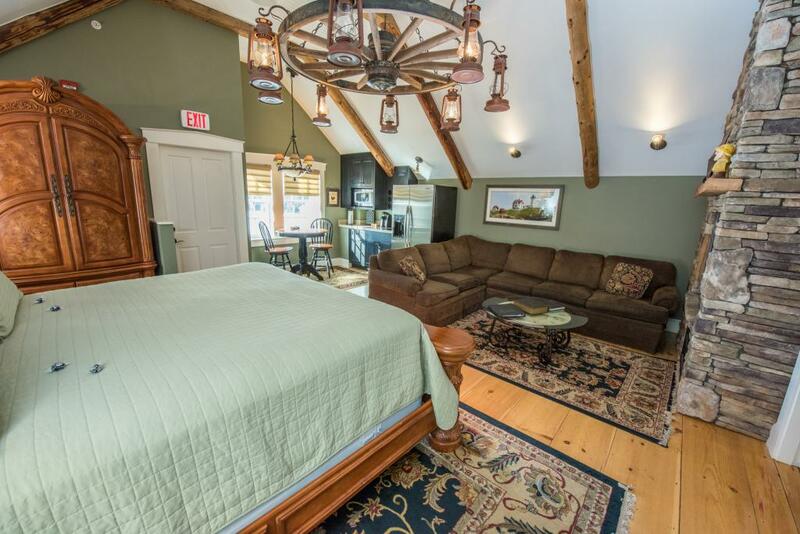 Barn Suite 2 is located on the South side corner of the barn on the second floor, our largest suite on this floor. 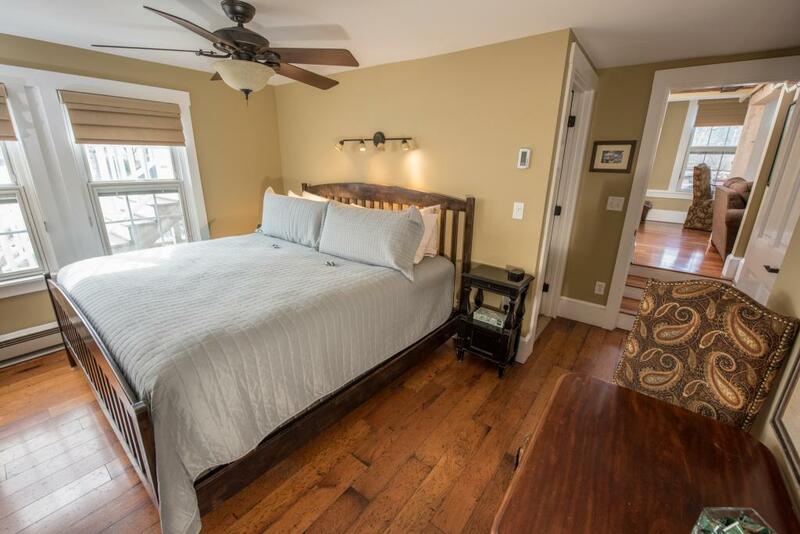 This bathroom consists of one of our largest steam showers, majestic hand crafted four poster bed and has beautiful cathedral ceilings in the bedroom and bathroom. Each bathroom at the gazebo is equipped with a blow dryer, carefully chosen toiletries consisting of shampoo, conditioner, lotion, wildflower body soap, bayberry hand soap, disposable makeup remover, and a vanity kit. All rooms have wifi access, two bottled waters. An ironing station is set up for guests, as well as a washer and dryer in our guest laundry room, where you will also find a large ice-maker and ice buckets.. Robes as well as towels for the pool and beach are available in our gym. Barn Suite 3 has a great location on the second floor with beautiful views of the pool, gardens & meadows. 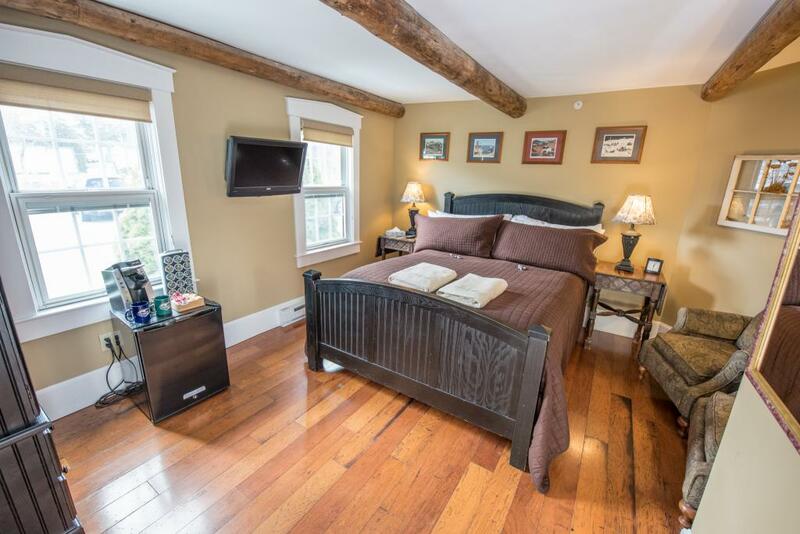 This room has beautiful cathedral ceilings in the bedroom, with a stunning black and white tile bathroom. Each bathroom at the gazebo is equipped with a blow dryer, carefully chosen toiletries consisting of shampoo, conditioner, lotion, wildflower body soap, bayberry hand soap, disposable makeup remover, and a vanity kit. All rooms have wifi access, two bottled waters. An ironing station is set up for guests, as well as a washer and dryer in our guest laundry room, where you will also find a large ice-maker and ice buckets.. Robes as well as towels for the pool and beach are available in our gym. 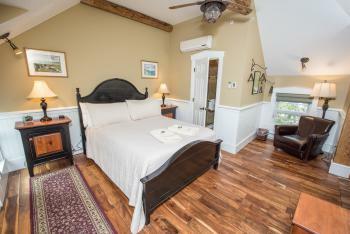 Barn Suite 4 is located in the front corner of the barn on the second floor with beautiful views of the pool & gardens. This room has beautiful cathedral ceiling in both the bedroom and bathroom, it is also one of the largest bathrooms at the Inn. Each bathroom at the gazebo is equipped with a blow dryer, carefully chosen toiletries consisting of shampoo, conditioner, lotion, wildflower body soap, bayberry hand soap, disposable makeup remover, and a vanity kit. All rooms have wifi access, two bottled waters. An ironing station is set up for guests, as well as a washer and dryer in our guest laundry room, where you will also find a large ice-maker and ice buckets.. Robes as well as towels for the pool and beach are available in our gym. King 2 is located on the second floor in the front of the Inn, accessed by original spiral stairs. This very spacious king has 15 foot cathedral ceilings with exposed original beams dated from the original 1847 farmhouse. King #2 is a very bright room with both eastern and southern exposure. This room has a large tile shower with a rain head. Each bathroom at the gazebo is equipped with a blow dryer, carefully chosen toiletries consisting of shampoo, conditioner, lotion, wildflower body soap, bayberry hand soap, disposable makeup remover, and a vanity kit. All rooms have wifi access, two bottled waters. 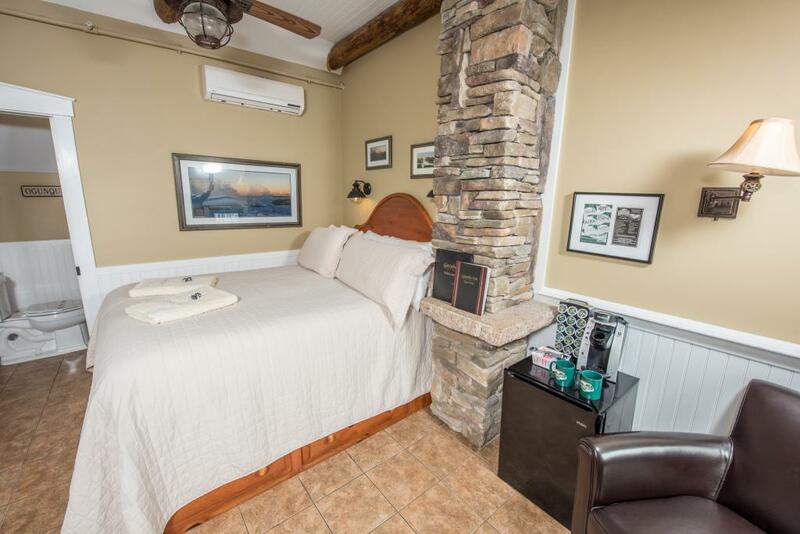 An ironing station is set up for guests, as well as a washer and dryer in our guest laundry room, where you will also find a large ice-maker and ice buckets.. Robes as well as towels for the pool and beach are available in our gym. Queen 1 has a southerly exposure and is located on the front of the house on the first floor. 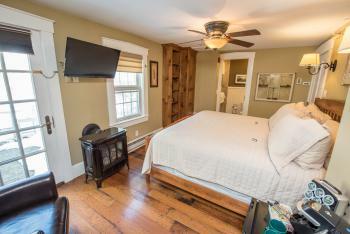 This room has easy access from the outside, as well as the nearby breakfast. 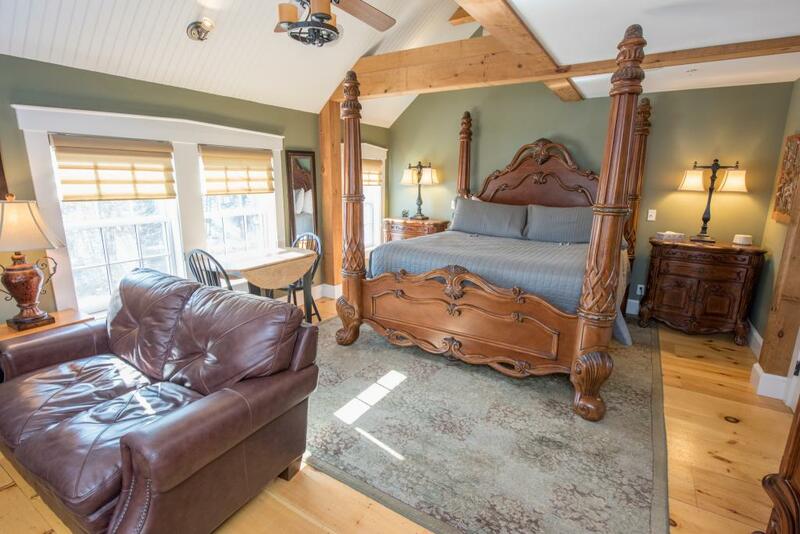 Queen 1 has a queen size bed, restored barn support beams in the ceiling, seating for two and is 15x14 in size. Each bathroom at the gazebo is equipped with a blow dryer, carefully chosen toiletries consisting of shampoo, conditioner, lotion, wildflower body soap, bayberry hand soap, disposable makeup remover, and a vanity kit. All rooms have wifi access, two bottled waters. 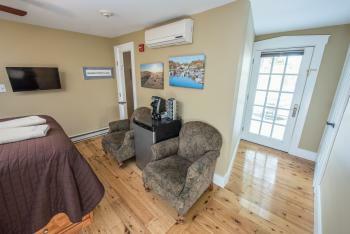 An ironing station is set up for guests, as well as a washer and dryer in our guest laundry room, where you will also find a large ice-maker and ice buckets.. Robes as well as towels for the pool and beach are available in our gym. 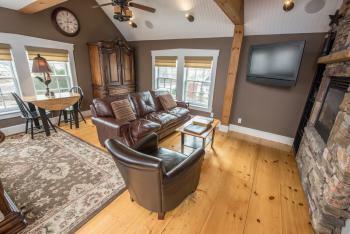 Barn Suite 5 is one large room located on the top floor of the barn this is our penthouse suite , the only room located on this floor for maximum privacy, this suite is the nicest the Gazebo Inn Ogunquit has to offer, adjacent to the 30x18 library. This room has two means of access, through the library which is private after 9pm, and a second entrance with access to the parking lot and pool area. This room is one of the few with a pullout sofa to accommodate extra adults at $50 per person per night. Each bathroom at the gazebo is equipped with a blow dryer, carefully chosen toiletries consisting of shampoo, conditioner, lotion, wildflower body soap, bayberry hand soap, disposable makeup remover, and a vanity kit. 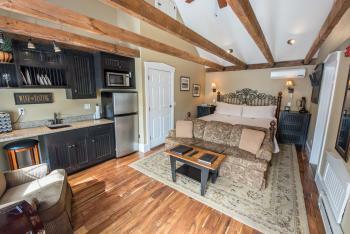 All rooms have wifi access, two bottled waters. An ironing station is set up for guests, as well as a washer and dryer in our guest laundry room, where you will also find a large ice-maker and ice buckets.. Robes as well as towels for the pool and beach are available in our gym. 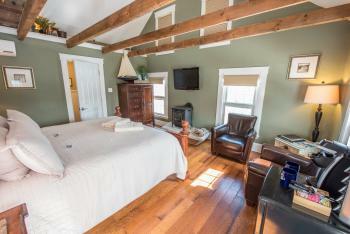 Gazebo Inn Ogunquit is a 14 room Inn, with all of the amenities of a large resort. Nestled in the quaint beach community of Ogunquit. Easy access to the Footbridge beach and more ! We look forward to being your host. Check-in is from 2pm - 5pm, check out prior to 11am. Gazebo Inn Ogunquit is a 14 room Inn, with all of the amenities of a large resort. Nestled in the quaint beach community of Ogunquit. Easy access to the Footbridge beach and more ! We look forward to being your host. Check-in is from 2pm - 5pm, check out prior to 11am.